Hi. My name is Melizza and I want to make all the things. So much so that I often find myself stuck, paralyzed with where to begin. There are so many lovely choices out there when it comes to sewing patterns. And like the typical goldfish, I get distracted by shiny new things. When Jennifer Lauren’s Cressida pattern came out I held back. As lovely as it looked, I figured I could easily draft myself something similar using my circle skirt pattern. But then after seeing a few versions online I decided I wanted to make it NOW. I wear my blue circle skirt to death. So much so that I really need to add some variety to my wardrobe by adding new ones. After fighting with the mandarin collar on my Alder dress, I decided it was a good time to take a break. A Cressida break. As much I’d like to think I would eventually draft the placket, I knew that I would very likely have little time to do it. And little time would just put me off from making it. So why not pay someone who’s already done the work for you? I bought the pattern, taped it up and went on my way. No grading. Went with the biggest size and it fits great. That rarely happens for me. RARELY. I used a funny medium-thick denim fabric that I really had a hard time telling if it was blue or black. Styling it as black denim worked but I wasn’t in love. After taking it out for a trial run I realized a few things I needed to change. Because it was a test garment I didn’t interface the placket or waist. I figured the fabric was thick enough. Now I wonder if I should have used interfacing on the placket because it turns towards the left side at the bottom. But that won’t distract me enough not to wear it. I also centered the top button better after noticing in the photo below it was off. I love having pockets in my skirts but I will leave them out next time. A cardigan covers the bulk at the hips but I’d like to have the option of not having to wear one. As for the hem, I didn’t want to lose much length so I simply serged the hem, folded once, and stitched. Easy peasy. I have two other patterns by Jennifer that I definitely need to make soon. Especially since they are tops and I am in desperate need of them. But first I need more Cressida skirts. I really love brushed cotton twill and I found a very pretty turquoise one set aside for my next one. This skirt, and a few like it, will become staples in my wardrobe. I love the swish factor. I can’t say no to the swish. This entry was posted in Sewing Success, skirt and tagged circle skirt pattern, cressida skirt, Jennifer Lauren. Bookmark the permalink. That looks like the perfect amount of swish! Now I want one. It goes beautifully with those turquoise heels too. Thank you! Those heels are my latest addition to my clog collection. They are so comfortable. Fantastic. And those are some super awesome clogs. There’s nothing better than a twirly skirt! You are adorable! I have the same problem, too many yummy patterns yikes! I guess we just need to dive in and make something! So hear you on the pleasure of taking a break from the troublesome patterns so you might just MAKE something, and what a great choice. This skirt fits you like a dream! I also really like what you did with the belt loops. This looks great on you! I feel the same way about making all the things. I have so many things on my list too, I feel like I’ll never make them all! Thank you! I took a chance on those Sven shoes and they proved super comfy. Mela, this is adorable! 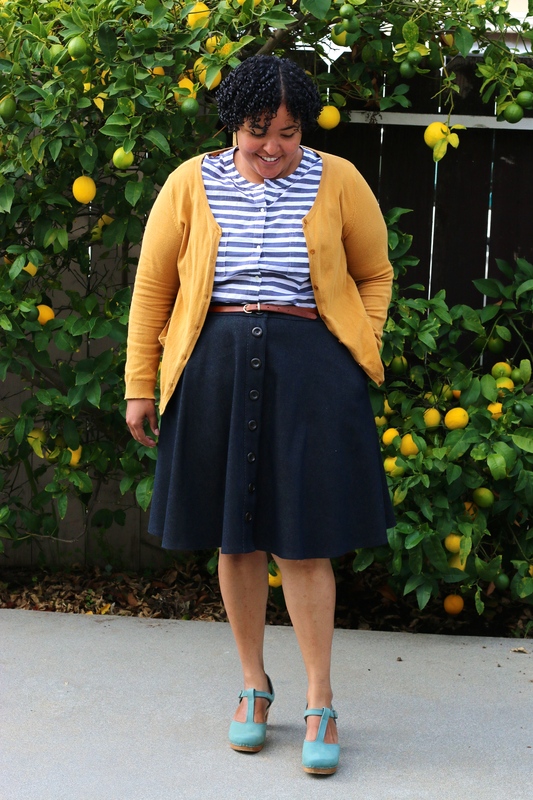 I love the mustard and blue on you- preppy rad! Preppy rad?! I love it. Thank you! Oh I adore this on you! Makes me reconsider buying the Cressida! 🙂 Love the styling, too. You rock that yellow cardigan! Thank you! It was a really easy pattern to work with. Taped up together quickly. All winning points for me. Fantastic! I love the Cressida on you, and it’s turned out so well. 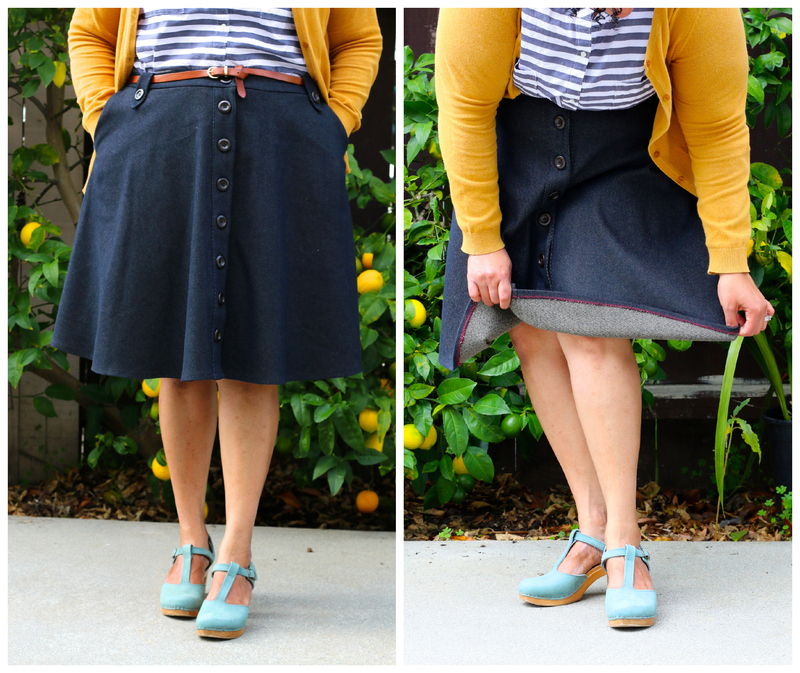 Really great length, and denim (or denim-ish!) is so versatile. Thank you! Denim-ish is such a spot-on description. I really don’t know what that fabric is made of! And the last thing we need is more hurdles. Sometimes the easier/lazy route is okay to take. I am constantly hampered by indecision about what I want to make, not helped by doing a pattern cutting class and knowing that I *can* draft my own things! Your skirt looks lovely! A pattern cutting class! That sounds really fun and challenging. That will open so many options for you. I’d love to take one one day. I love your styling here! I’m the same way! I have so many patterns that I haven’t touched yet–I always overestimate the time I have and underestimate how long a project will take. 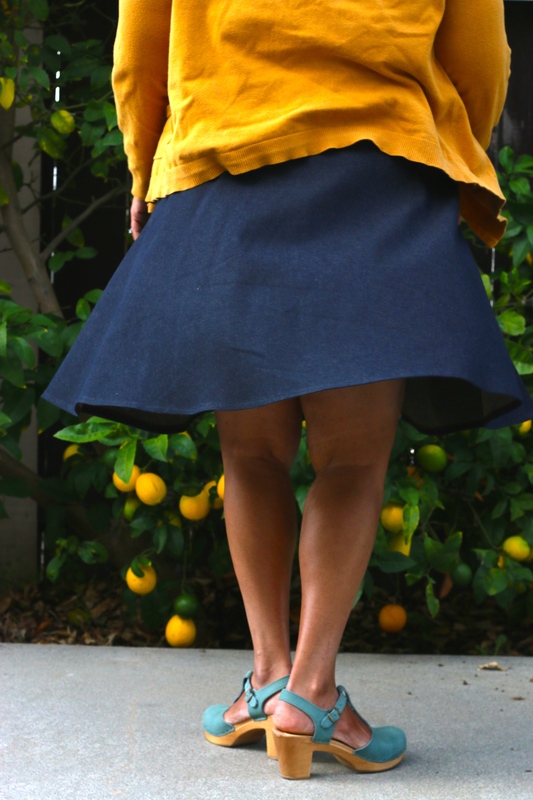 Love this skirt on you — that silhouette is so flattering. And beautiful work. That stripey top is completely adorbs, BTW! What an amazing idea!! I must try this! I’ve been on the fence with this one too – still not convinced skirts are for me. I prefer dresses. But now you have me thinking, yours is super cute and has perfect twirlability!! I think this would be an easy pattern to grade up. I imagine you can cut the waist lower, and extend the hem longer to compensate. Does that make sense? I can see this in twirly fabric. Just something not too slinky? Maybe? The button band could misbehave without some sort of body. awesome! I’m going to go for it! 🙂 Have you tried the version with two rows of buttons? That’s uber cute! 🙂 Very sailor-ish. Not yet! I’d love to try it. Hopefully I won’t forget to. My to-sew list is ridiculously long.